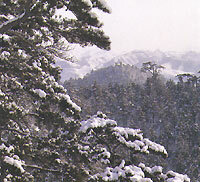 The northwestern part of the Mountain Summer Resort is a vast stretch of tall mountains and deep ravines. A number of tiny kiosks stand on mountain summits to render a picturesque touch to the entire scene. The Pavilion on the southern Mountain of Accumulated Snow, located on the southern edge of this mountainous area, provides a vantage point for marveling at the snow-capped mountains in the south. The entire scene looks majestic in a magnificent way.